Sometimes there’s nothing better than a good climb. It’s a true test of you vs the mountain, but a lot of the time it can be a bit dull – we’ve trundled up countless seemingly never-ending fire roads and spent the whole time wishing for an uplift. Thankfully Joe Falanagan has come up with a new way to ensure every climb is is enjoyable – the Climb Ride. Instead of pedalling to the top, Joe dismantles his bike, straps it to his back and rock climbs to the top of the trail. At the top he re-assembles the bike and shreds it down. This particular ride was shot at the Pike of Stickle in the heart of the Lake District and sees Joe solo the Middlefell buttress before descending Stake Pass but we reckon there would be loads of great riding available to anyone that was able climb and ride. 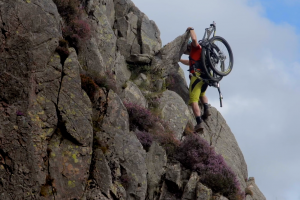 Joe is clearly bonkers and this could well be the most risky thing we’ve seen with a bike since the Red Bull Rampage. Given the infamous Lakes weather and the fact he uses no harnesses or ropes, Flanagan is really taking his life into his own hands. The swim at the end looks bracingly cold too. Flanagan is also an Enduro World Series racer and last year finished 97th in the overall. His best result last year was 51st in Rotorua.